Hell was let loose at the premises of Osun State House of Assembly on Wednesday as some angry pensioners in the state stormed the Assembly in protest and pounced on lawmakers, beating them black and blue. 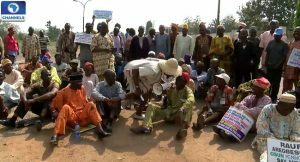 The aggrieved pensioners staged a fresh protest over the non-payment of their pension and gratuities by the state government before marching to the Assembly Complex at Abeere to vent their anger on what they termed ‘move by the legislators to prevent the Senate from probing the spending of the bailout funds received by Governor Aregbesola’. Our correspondent in Osogbo, the capital of Osun State, Bosede Sodiq, reports that some legislators had attempted to pacify the seemingly angry protesters before they became violent and attacked the members of the parliament. 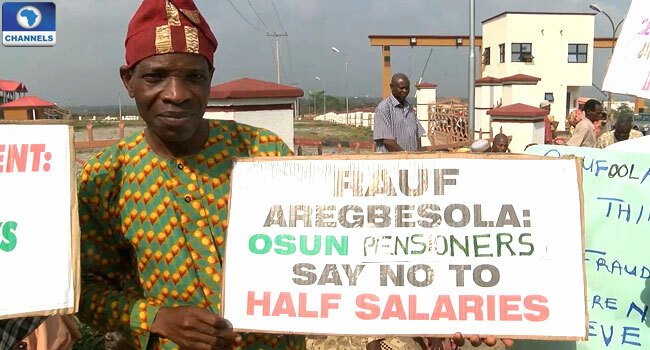 Before the pensioners arrived the Assembly ground, the lawmakers were said to be probing the state’s 34.5 billion Naira bailout fund received by the administration of Governor Aregbesola. The pensioners protest stalled their sitting. The pensioners had stormed the House of Assembly as early as 9:00 a.m. and prevented those summoned by the House from gaining access into the premises. The protesters described the probe as “kangaroo arrangement” designed to prevent the Senate from carrying out a genuine probe on the bailout fund released to Osun by the Federal Government. The House had summoned those concerned with the finances of the state, including the Accountant-General, Permanent Secretaries of the Ministry of Finance, Office of Budget Planning and Director-General of Debt Management Office to appear before it with documents relating to the bailout fund. Others summoned by the House were Osun State Chairmen of Nigeria Labour Congress, Trade Union Congress, Joint Negotiation Council and the Nigeria Union of Local Government Employee and officials of Wema Bank, Zenith Bank and First Bank. But the probe was stalled as the pensioners sighted the legislators in the premises of the House of Assembly, beating and raining curses on them. The pensioners harassed the Deputy Speaker, Honourable Akintunde Adegboye, who attempted to address them. The Deputy Speaker, Hon Akintunde Adegboye, was lynched seriously before policemen and officials of the Nigeria Security and Civil Defence Corps rescued him from the pensioners. The leader of the pensioners, Comrade Yemi Lawal, insisted that the purported probe by Osun State House of Assembly was immaterial at a time that the Senate wanted to probe Aregbesola on the bailout fund. He said: “This will be the seventh time we will be visiting the House of Assembly for the same purpose, that is non payment of our gratuities and 10 months pension arrears. About two weeks ago, we went out again but since then there has been no response from the government. It is as if we are being ignored. “Constitutionally, it is our right. We are not begging for money, we are asking for our right. Our people are dying everyday. Many of our students are at home. Aregbesola is keeping our gratuities and pensions. “He ought to have said something but he is not saying anything. So we have decided to tell the whole world that Aregbesola is pathologically wicked. “He is not the people’s friend. He presented himself as a messiah but he is not. So whatever happens, we want our money. President Buhari was very magnanimous last year when he released 35 billion Naira to pay outstanding gratuities and pension but Ogbeni Rauf Aregbesola said he will not use the money to pay workers salary and he diverted 16.7 billion Naira out of that money. If he had used the money judiciously, this problem would not have arisen at all”. ‎He further asked the state government to “get the money from wherever he kept it”. “We are senior people and we helped to build Osun State to the enviable state that it is today that attracts him from Lagos to come and become governor of Osun State. “The lawmakers truly are our representatives but they are rubber stamped. They are not representing us well. When the governor diverted the money, we came to this house to cry to them for help but what did they do, nothing! “ICPC indicted the governor. They did not raise any eyebrow. Now that the Senate wants to investigate they are now saying the Senate has no right to probe the government. They are bundles of illiterate if not they ought to know that the Nigerian Constitution allows for the Senate to set up committee to probe anybody be it state, local or anyone,” he retorted. ‎He noted that the pensioners were aware of the plan of the state legislators to stage-manage their own probe and use it to thwart the real result of the probe. The Chairman House Committee on Finance and Appropriation, Honourble Kameel Oyedele, said the government has done a lot to make life meaningful for the workers and the pensioners. “We actually invited all these people to appear before the House today in connection with the bailout fund. Now these pensioner have started demonstrating. What is the point of demonstrating? I know majority of those invited have been sent away. Why didn’t they just make their case or grouse very simple?” he asked. “We have the power of force through the ‎ constitutional provision particularly on the money appropriated to the state. We are all privy to the inflow of income to the state since 2013. We in turn lodged the complaint to these people. What we need to do is dialogue and jaw -jaw to bring peace. “There is nothing anyone can do about this because revenue, as I stated before, I have salaries that have not been paid and I have allowances not paid yet,” he told Channels Television. “We are only praying that miracle should happen, with a release of whatever money is accrued to the state. We all should be ready to sacrifice and make Osun great again,” Honourable Oyedele stated. The State Assembly had warned the Senate against probing how the bailout fund received by Aregbesola was spent, saying that the upper chamber would be crossing its constitutional boundary should it embark on the investigation.